blogs about Michael Brantley and the Cleveland Indians, written by a diehard fan. i have no affiliation with the team, i just love 'em. as you can see, i have decided to be way more detailed with my Brantley documentation this season. 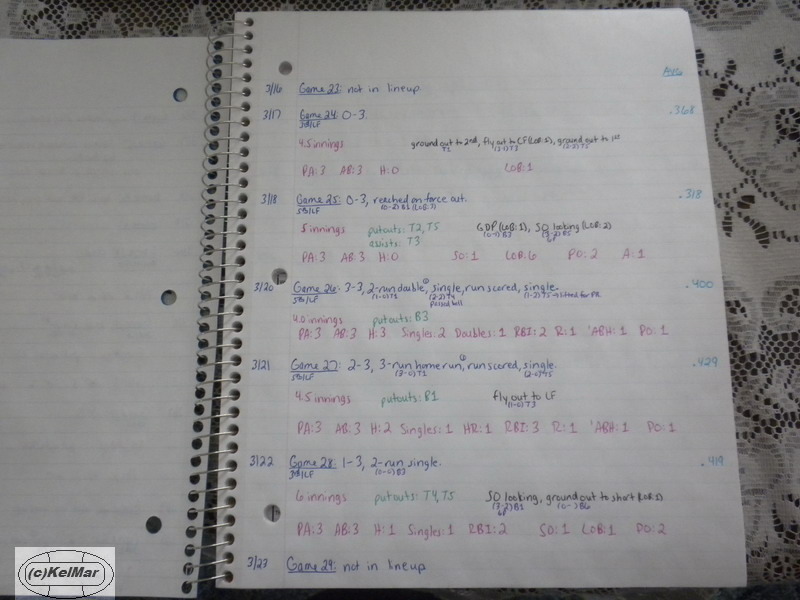 i have a lot of information colored coded in my Brantley 2013 statistics notebook. however, to try and keep these blogs as simplified as possible, i will not be typing all of that information here lol anyone reading these will thank me haha so let's get to it. Michael played in 18 (of 36) games in spring training. he started and played left in 17 games, and he started and DH'd in 1 game. he missed 12 games after getting lacerated on his left forearm by Josh Donaldson while sliding into 3rd base in the 5th game of the spring. he also did not play in 6 games due to just not being in Tito's lineup. Michael had a hit in 10 of the 18 games he played and reached base in 12 games. Michael bat 5th in 10 games. Michael bat 6th in 1 game. Michael bat 3rd in 4 games. Michael led off in 1 game. Michael bat 2nd in 2 games. Michael played left in 17 games. Michael was the DH in 1 game. now let's break down his numbers based on where he hit in the lineup. 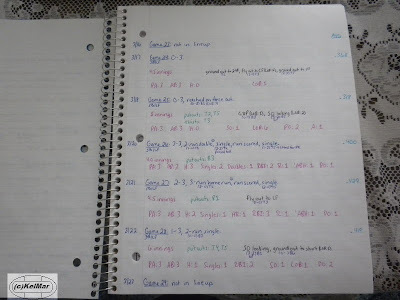 here are my game-by-game notes and numbers for Brantley's Spring Training 2013. Game 6, February 26: Tito announces Michael will be shut down for 3 days and he's expected to miss 10 days. Game 7, February 27: shut down. Game 8, February 28: shut down. Game 9, March 1: Michael resumed lower body strength and conditioning. Game 13, March 5: Michael resumed all activity except on-field bp. he hit off the tee and did throwing. will have his stitches removed in a few days. Game 14, March 6: expected to play Sunday. Game 15, March 7: Michael had his stitches removed today. he returned to full-squad practice and will see game action by Sunday. Game 16, March 8: Michael took BP today. will play Sunday. Game 21, March 14: not in lineup. Game 23, March 16: not in lineup. Game 29, March 23: not in lineup. Game 32, March 26: not in lineup. despite missing a dozen games because of the forearm injury, Michael had a very solid spring with a very (as his nickname suggests) "smooth" swing. he started out smoking hot, lost his timing a little when he returned from the injury, then settled in once again. i think any player who's had ~50 at bats and finishes spring with a batting average over .300 performed well. i am pleased with Michael's spring. it sounds like Michael will mostly be hitting 5th in the order this season. i like that he'll be batting behind Swisher, as opposed to Santana. but for the people who like to get on Michael for his stolen bases, or lack thereof, they better lay off a little because i don't know how many opportunities he will have to steal now batting in this spot. especially if Swisher is on base in front of him, a guy who isn't all that interested in stealing. Michael will have the green light to run, no doubt, but the question is how many times will he get on base with no one ahead of him? first, i really hope this is the year that Michael plays a full season without injury. no more freak injuries in August or September that cause him to miss games or be shut down sooner than the year ends, please. batting average wise, i would love to see him finish the year close to .300. i'd be very happy with a BA between .295-.300. yeah i'm probably aiming a little high but i have confidence that he can do it. he's been getting better and better every year, and i really think this could finally be attainable for him. with our new offseason additions, i don't know if he'll finish the year with the highest BA on the team again, but he should still be one of our top and most reliable hitters. also because of our offseason acquisitions, Michael really doesn't need to worry much about home runs. however, i think he can still hit at least 8. and despite those who want him to hit for more power, i think this is fine. he'll make up for it by hitting plenty of doubles. Michael should have another high RBI total batting in the middle of the order for the year. i'll predict/expect at least 75. then again, it depends on how well the guys in front of him hit, and if they consistently get themselves on base in order for Michael to bring them home. Subscribe For Email Alerts When I Post A New Blog! the first thing you need to know about me is i am a Ride Or Die Cleveland Indians fan. the second thing you need to know is that I AM MICHAEL BRANTLEY'S #1 FAN. this is not debatable. read my Who's Writing This Stuff?! page or my Introduction blog (9/6/13) for more info and proof that i can back that up. Vote Brantley for MLB's 2017 All Star Game! Simple theme. Theme images by spxChrome. Powered by Blogger.